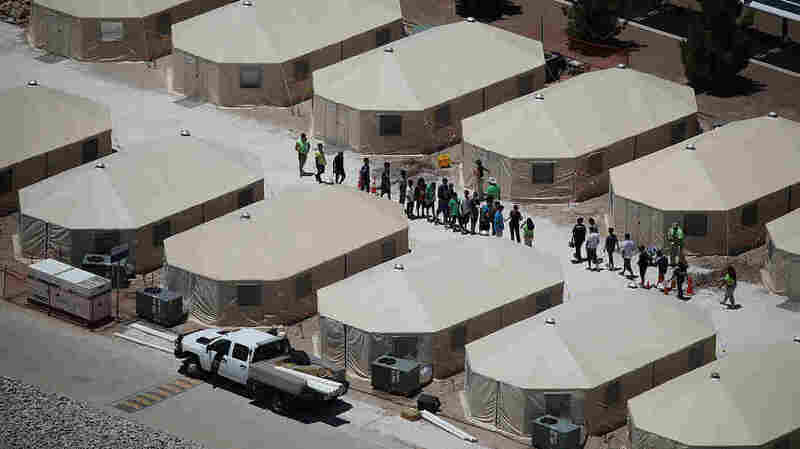 Almost 15,000 Migrant Children Now Held At Nearly Full Shelters With government shelters across the country nearing capacity, officials are considering a range of options from releasing the children more quickly to building more tent cities. Children and workers are at a tent encampment in June near the Tornillo Port of Entry in Tornillo, Texas. The national network of more than 100 shelters are 92 percent full, according to the Department of Health and Human Services. The situation is forcing the government to consider a range of options, possibly including releasing children more quickly to sponsors in the United States or expanding the already crowded shelter network. Most of migrant children are teenage boys from Central America who travel to the border alone. Many are escaping poverty or gangs, and they plan to ask for asylum and ultimately find work or go to school in the U.S. The largest migrant youth shelter in the country is in Tornillo in remote west Texas. About 2,800 children live in heated, sand-colored tents set up on a patch of desert a few hundred yards from the Rio Grande. A source familiar with Tornillo's operation, who asked not to be identified because this person had not been authorized to speak to the media, said the shelter is taking in roughly twice as many kids every week as it is able to release. "This is unsustainable," the source said. The federal government could add more beds at Tornillo or elsewhere. Another option is to release the minors more quickly to sponsors who agree to take the children — usually a family member who's already living in the U.S. The children stay with this sponsor while their asylum case is pending. Federal officials screen the sponsors, but that vetting process has slowed to a crawl because of a new policy that says anyone who lives in the sponsor's house can be fingerprinted for a criminal background check. The Trump administration, when implementing the policy earlier this year, said officials are taking these extra precautions to ensure children aren't put in danger. A senior official with Health and Human Services said it would be "premature" to say what action would be taken to address capacity issues at the shelters. The official spoke on the condition of anonymity because a plan hadn't been finalized. When asked whether the government is considering relaxing the screening of sponsor households, the official said that "everything is on the table." The official also said the shelter network could be expanded. "We continue to look for options that don't jeopardize child safety," the senior official said. The official also blamed a broken immigration system that acts as a "perverse incentive" for undocumented children to cross the border in the first place. "Detention is never in the best interest of a child, especially when it's extended," said Jennifer Podkul, senior director for policy and advocacy at Kids In Need of Defense. "It's bad for the child's mental and physical health." Podkul said child welfare experts agree it's best to put kids in smaller facilities, not larger ones, where they can be affected by isolation and illness. Vince Perez, the El Paso county commissioner whose precinct includes Tornillo, wants the facility to close. "We're already battling the perception that [El Paso County] is inherently a violent place. Now you have a massive detention facility where you have thousands of children detained there. It's deplorable," Perez said. Last month, the Office of Inspector General at Health and Human Services identified two "significant vulnerabilities" at Tornillo. The contractor, BCFS, did not conduct FBI fingerprint background checks on its 2,000 staffers, though it had performed routine criminal background checks. And the facility lacked enough mental health clinicians for the swelling number of children. BCSF officials have defended the camp, insisting that it is not a detention facility and that the employees are not guards. They say every child has access to three hot meals, snacks, education classes, medical care, soccer games, movie nights and, soon, Christmas festivities.